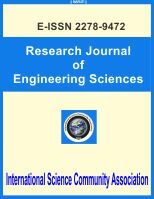 International Science Community Association are publishing an international peer reviewed monthly journal Research Journal of Engineering Sciences "RJES". It is the vision of International Science Community Association to publish research papers, research articles, review papers, mini review, case study and short commutations in all areas of human study without financial restriction. Coverage Area: Researches in the field of engineering science such as Electrical Engineering, Electronics Engineering, Computer Engineering, Information Engineering and Technology, Software Engineering, Mechanical Engineering, Industrial and Manufacturing Engineering, Automation and Mechatronics Engineering, Material and Chemical Engineering, Civil and Architecture Engineering, Biotechnology and Bio Engineering, Environmental Engineering, Petroleum and Mining Engineering, Marine and Agriculture engineering, and Aerospace Engineering, Neural Networks, Plastic Engineering, Food Technology, Textile Engineering, Nano Technology and Science, Power Electronics, Electronics and Communication Engineering, Computational mathematics, Image processing, Structural Engineering, Manufacturing Engineering, Fire Engineering etc. International Sciences Community Association publishes all its journals in full open access format which are easily accessible for scientific community. International Science Community Association does not have any income source. Therefore, International Science Community Association needs to defray its production and maintenance costs by collecting Manuscript Processing Contribution from author, authors' institutes or research funding bodies.